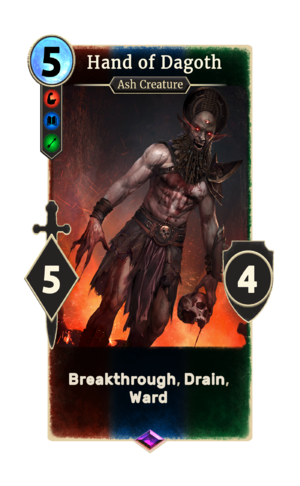 Hand of Dagoth is an epic House Dagoth creature card. It is part of the Houses of Morrowind expansion. Ash Vampires first appeared in Morrowind. The card previously had 5 health, but this was decreased in patch 1.72.4. This likely depicts, Dagoth Uthol who also appears in Morrowind. This card also depicts the same environment he appears in and also has his dialogue as his voice. This page was last modified on 2 March 2019, at 00:41.